So, this is a special year, because as you might know, Re-Volt will be 20 years old this year, 9th of march. The game had been through so much, got a lot of improvements, new features, it is available in mobile phones as well, thanks to the developers and we've got a lot of content, tracks and cars as well in good and high quality. Since as I've already mentioned this is a special year, Kipy and me announce that we working on 20 cars this year related this anniversary. We will reveal them step by step. Mostly the reason is we want to make these cars as good as we can do. Hope you will like them. 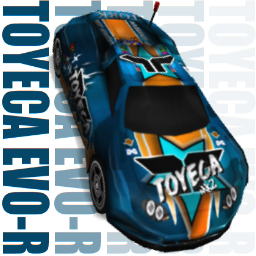 So first of all, introducing Toyeca Evo-R MK2! As you can see, it's a new version of ye ol' car Toyeca, improved and a real beauty. It is based on Porsche Carrera GT and it is a new addition to the newer Super-Pro class. It is remodeled from the original Toyeca, with some parts form an actual Carrera GT conversion (thanks to Skarma), parameters were also done by me and tweaked by Kipy.From my opinion, this must be one of my best cars i ever did, hehe.